Leads all inductees by being named on 95% of ballots cast. IRod, Schilling miss out. 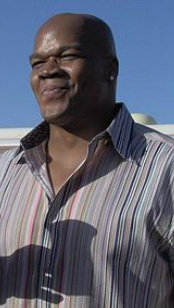 It was no surprise that Frank Thomas was selected as one of the members of the inaugural GUSSOMO Hall of Fame. It is especially pleasing that he led all players who got in with 95% of the votes cast. Other players who made the Hall were Ken Griffey Jr, Randy Johnson, Greg Maddox and Pedro Martinez, all worthy and all were included on Fred Turtle's ballot. "This is quite an honor", said Thomas at a press conference. "To become an inaugural member and one of only two hitters to make it is humbling. My only wish now is that some of my fellow Mob teammates join me in the years to come". The other two nominees from Chicago, Curt Schilling and Ivan Rodriguez did not make it this time. Both did receive enough votes to remain on the ballot for next years selection. When asked to comment, Schilling stated that he was slightly disappointed but had no ill will towards the voters. "Just look at the pitchers who did get in", said Schilling. "There is no shame in not getting in with those three guys on the ballot". Ivan Rodriguez commented that while he had some hall of fame type seasons that his total stats suffer a lot from injury years. Also, his stats for defense are not accounted for. "Larry Steinberg did an amazing job in compiling The Mob's stats since 1980 but he was unable to capture defensive stats for anyone. Not blaming him. It was impossible to do before the computer game and true defense is very hard to measure even with the computer game." True enough. That -4 and sometimes -5 arm shut down even the most ambitious of base stealing teams and we will never know how many runs Ivan prevented with his defense. A ceremony will be held honoring Thomas at Terrapin Station later in the season.